Built by Martin in Baltimore, Maryland. Delivered to the U. S. Army Air Force as B-26 Maurader serial number 40-1552. Disassembled and transported as deck cargo on a cargo vessel across the Pacific to Australia and unloaded at Melbourne. On April 5, 1942 arrived at Commonwealth Aircraft Corporation (CAC) for reassembly and testing at Laverton Airfield. On July 17, 1942 assigned to the 2nd Bombardment Squadron. Assigned to pilot 1st Lt. Clarence E. McClaran and flown from Laverton Airfield northward to Reid River Airfield. TSgt Frank Barcovic was assigned as crew chief. Nicknamed "Rose of San Antone" after the popular song of the same name by crew chief TSgt Frank Barcovic. The nose art included a red rose with pink highlights and green leaves. The nickname was painted on the left side of the cockpit below the pilot's window with a row of bombs indicating missions flown. Modified with enlarged waist windows with two smaller windows above them. The 30 caliber machine guns in the waist windows and tail were replaced with 50 caliber machine guns with 500 round ammunition cans and flexible tracks were installed in each gun position installed near the top turret position. The guns and equipment were salvaged from a B-17. Later, this gun modification became standard on all 22nd Bombardment Group bombers. 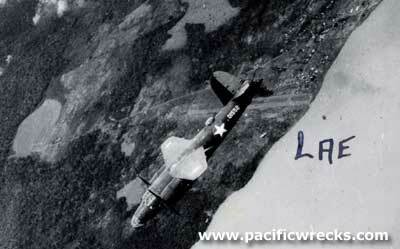 On August 7, 1942 took off on a bombing mission against Lae. This was the bomber and crew's first combat mission. On August 8, 1942 took off on a bombing mission against Salamaua. On August 13, 1942 took off on a bombing mission against Buna. On August 17, 1942 one of ten B-26 Marauders parked at 7 Mile Drome near Port Moresby fully fueled and armed with 500 pound bombs. On the ground, there was no advanced warning of a Japanese air raid against 7 Mile Drome by G4M1 Betty bombers from the 4th Kokutai and Misawa Kokutai escorted by A6M2 Zeros from the Tainan Kokutai. Aboard this B-26, pilot Lt. McClaran was starting the engines when a Japanese bomb landed roughly 20 yards away and riddled this bomber with roughly 50 shrapnel holes. Aboard, McClaran was hit in the face and knocked unconscious. Engineer Caputo was injured in his ankles when he jumped off the wing, then crawled back to rescue McClaran. Afterwards, this bomber was repaired. During late October 1942 flown to Darwin for bombing missions against Timor between November 2-4, 1942. On December 13, 1942 a bombing against Gasmata. On December 14, 1942 took off piloted by McClaran on a bombing mission against Japanese forces at the mouth of the Mambare River. Afterwards, flown to Reid River Airfield and loaned to the 408th Bombardment Squadron. During early January 1943 flying via 7 Mile Drome, this B-26 participated in several bombing missions against a Japanese convoy bound for Lae with missions against Salamaua on January 5, 194. On January 6, 1943 bombing mission against Lae. On January 7, 1943 took off piloted by O'Donnell a bombing mission against a Japanese convoy bound for Lae. On January 8, 1943 took off from 14 Mile Drome at 6:45am piloted by Moore on a bombing missions against a Japanese convoy off Lae and returned. That same afternoon one of five B-26s that took off again from 14 Mile Drome at 1:00pm piloted by Captain O'Donnell. Over the target, the formation bombed Japanese shipping off Lae Airfield then returned by 4:20pm. After these missions, returned to Reid River Airfield. In total, this aircraft flew 13 combat missions. The scoreboard on the left side of the cockpit was painted with 33 bomb markings indicating missions, which included ferry flights, take offs to escape air raids and other non-bombing missions. During early 1943, stripped of olive drab paint to the bare aluminum finish and the propeller spinners painted red, with mission markings repainted in black. Used by the 2nd Bombardment Squadron as a "fat cat" to transport, with the nose art of a white cat on a black background painted on the side of the nose until June 1943. During July 1943 transfered to the 19th Bombardment Squadron and returned to flying combat missions. On August 25, 1943 piloted by Irwin on a mission against Lokanu Bridge. On August 26, 1943 took off piloted by Irwin on a bombing mission against Bogadjim bridge and the next day the same target piloted by Moleski. On September 2-3, 1943 piloted by Rugroden on missions over Cape Gloucester. On September 16, 1943 piloted by Hathaway on a mission over Lae. On September 18 piloted by Moleski over Finschafen and the nest day the same target piloted by Rugroden. On September 21, 1943 piloted by Thompson over Wonam Island near Tami Island Group. On October 27 piloted by Burcky against Kiari village. On November 8, 1943 piloted by Gillespire against Sattelberg. On November 16, 1943 piloted by Williams against Fior. On November 17, 1943 piloted by Williams against Sattelberg. On November 18, 1943 piloted by Gillespire against Sattelberg. On November 20, 1943 piloted by Gillespire against Sattelberg. On November 24, 1943 piloted by Burcky against Sattelberg. On November 28, 1943 piloted by Burcky over Bonga-Warea Track. On November 29, 1943 piloted by Finn over Cape Gloucester. Afterwards, this B-26 did ceased flying combat missions and was likely used as a "fat cat" transport aircraft. Assigned to crew chief TSgt Ernest E. Frese with SSgt Roy R. Carson with mechanics SSgt George B. Roth, Pfc A. R. Kolosky and later Sgt R. J. Marnilla. Likely, this aircraft was one of the last B-26 Marauders in service with the 22nd Bombardment Group. During early 1944, flown to Brisbane as war weary and scrapped. "1552 (22nd BG, "Rose of San Antone") scrapped at Brisbane, Australia Jan 1944"